Team building activities for work are an important part of any healthy working environment. By getting people together with their colleagues outside of the office to partake in fun and challenging exercises, team-building activities facilitate the formation of stronger bonds of friendship and cooperation within a team. Without these essential attributes, a team is always less productive and efficient – and the members of it less fulfilled and less contented by their work. It is therefore very important to continuously invest in the teambuilding process. Critics of team building activities usually accuse them of being childish time wasters, but there is little that is more firmly established and time-assured than the development of strong working relationships between staff members - the very foundation of any successful industrial or corporate enterprise. At Race Party, we understand the importance of teambuilding activities for work, and we believe we offer the most fun and hassle-free team building activities in Melbourne. 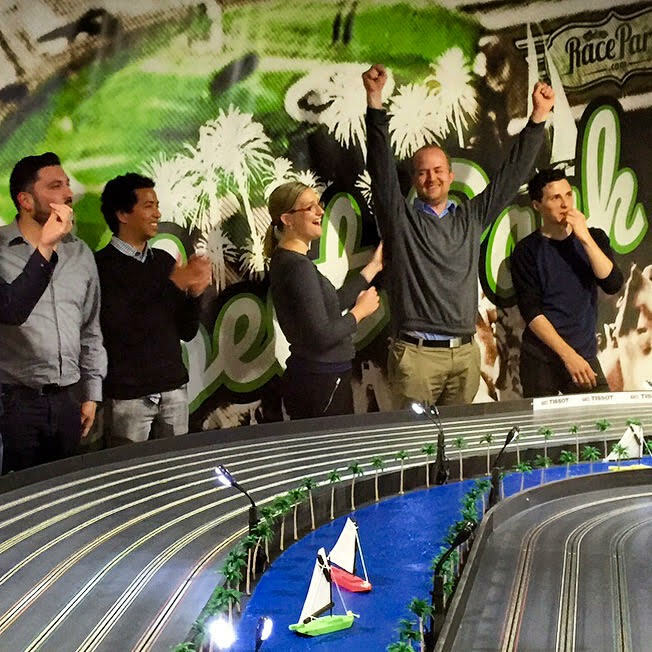 With no health and safety worries or logistical headaches, slot car racing makes for the perfect team building activity. All of your team can come together in one place and, in an environment characterised by friendly competition, socialise and network while trying their hand at a new and unusual hobby. We have a great selection of slot cars and race options, and both Albert Park and Monaco themed tracks. So there’s plenty to keep everyone interested and engaged throughout the entire session. The excitement and energy that washes over the room once the races start is difficult to imagine to those who haven’t experienced it, but it’s entirely infectious and completely addictive! At the controls of a miniature vehicle of your choice, you can steer your way round the 40 metres of twists and turns in an excited attempt to claim victory over your competitive colleagues! And you don’t have to worry if it’s your first time: our friendly staff are here to help, and are only too happy to give you all the advice and guidance you need to get maximum enjoyment from the experience. You’ll have plenty of time to practice before the competition begins, and even when you’re not a direct part of the action, the Race Party staff will provide in-race commentary to keep everyone informed as to what’s going on the track. At Race Party, we’ve gone the extra mile to create a service that is entirely convenient and customisable. You have the option of booking a full 9-5 teambuilding day, or simply working the teambuilding into a standard working lunch with our convenient ‘Pit Stop’ lunch package. If you opt for the ‘Pit Stop’ 90-minute lunchtime package, you’ll get an hour of hosted racing time plus a selection of gourmet sandwiches, rolls, wraps and drinks. The perfect way to inject some excitement and energy into the working day, this is a real novelty package that will get colleagues interacting, socialising and forming working bonds without causing the disruption that a whole day of teambuilding can cause. If, however, you have decided that it’s time for a full day of team activities in Melbourne, our full day package makes the process of planning it entirely stress-free – and gives you the peace of mind of knowing that you’re in the capable hands of an experienced team of professionals. With a range of light snacks and refreshments on offer throughout the day, as well as a full catering service at lunchtime and private hire of our state of the art conference and meeting facilities, you can be sure that your team bonding activities in Melbourne will meet and surpass all your expectations when you come to Race Party. When planning your event, you’ll have complete freedom to design your own schedule and set your own pace. So it’s entirely up to you to decide when you work and when you play. And when it does come to lunchtime, you can choose between a great selection of delicious gourmet sandwiches, wraps and rolls, as well as hot and cold platters. We’re also more than happy to cater for those with specific dietary requirements and preferences, such as vegetarians – so rest assured that everyone in your team will be well looked after and entirely satisfied with the food as well as the activities! And if you’re looking for team building activities in Melbourne that are a little more extensive than our ‘Pit Stop’ package, but a little less disruptive to your office’s daily routine than a full day out, we’re always more than happy to offer a half-day service if this is more suitable to your particular situation. You don’t have to worry about not having access to everything you need to get a productive day’s work in alongside your teambuilding activities. When it comes to the work part of the day, you’ll have access to our extensive range of office facilities, such as a 42” LED Smart TV, Wi-Fi internet access, a whiteboard and markers, and your own private meeting room. So you can be confident that you’ll achieve everything you need to with absolutely zero hassle. If you’re looking for novel team building ideas in Melbourne, you won’t find a simpler or quirkier way to ensure your team building activities for work are popular with the whole team. Race Party’s impressive combination of outstanding office facilities, extensive and high quality catering solutions, friendly and enthusiastic staff, and ultra-fun and unusual activities make it the perfect place for team building activities in Melbourne. And because we offer all of these safe, reliable and crowd-pleasing services at extremely reasonable prices, you can be happy in the knowledge that you can provide great team building activities for work without breaking the bank. So don’t delay: browse our website to learn more, or contact a member of our team for more information about how we can work with your company. This fun teambuilding event is easy to arrange and more affordable than you’d expect – and it’s bound to make you the most popular person in the office!